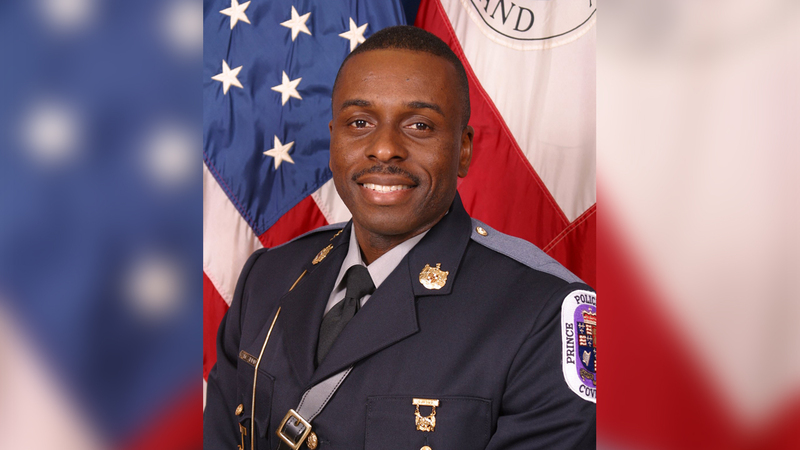 A funeral was held Friday for the Prince George's County police officer who was killed helping a neighbor who was being threatened by her estranged husband. Cpl. Mujahid Ramzziddin lost his life helping the woman on Wednesday as he was off duty in his own neighborhood in Brandywine, Maryland. 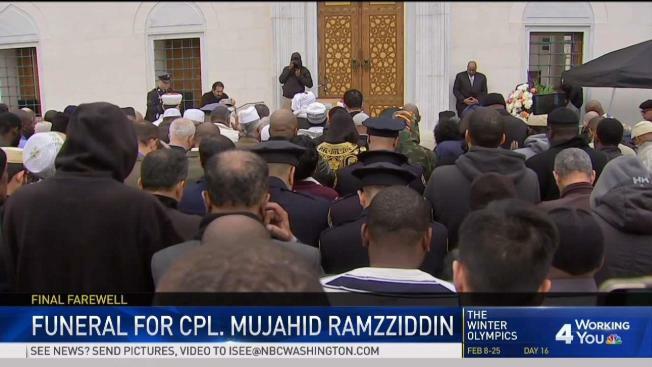 Ramzziddin's funeral began outside the Diyanet Center of America in Lanham with the Muslim call to prayer. Imam Ali Tos spoke about Ramzziddin's commitment, even in death, to helping others. "There is no holier death than dying protecting the innocent," he said. Prince George's County Police Officer Mujahid Ramzziddin in an undated photo provided by the department. Ramzziddin was fatally shot on Wednesday, Feb. 21, 2018 while trying to protect a neighbor during a domestic dispute, police say. 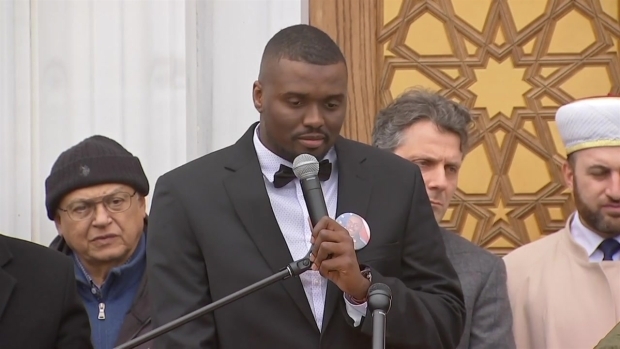 Ramzziddin's son, Eric Tyler, honored his father's bravery. "When he heard knocking at his door, he could have stayed home. He didn't," Tyler said. "My dad's a hero." Tyler said he washed his father's body upon his dad's request, following Muslim tradition. "I got the opportunity to tell my father I love him, for the last time," Tyler said. Police Chief Hank Stawinski cited the Koran and spoke about who Ramzziddin was. "Mujahid Ramzziddin lived a consequential life and in sacrificing himself to save another, he died a consequential death," Stawinski said, fighting tears. Eric Tyler, the son of fallen Prince George's County police officer Cpl. Mujahib Ramzziddin, spoke at his funeral Friday. "God bless all of you we lost along the way. Godspeed to all that serve today," he continued. Ramzziddin was set to be buried at Fort Lincoln Cemetery in Bladensburg. First responders and civilians lined the route the funeral procession made, saluting and clasping their hands to their hearts. Fellow officers and Ramzziddin's family were set to hold a celebration of life at Fraternal Order of Police Lodge 89 in Upper Marlboro. Ramzziddin was a Marine Corps veteran, a father of four and his mother's only son. He served on the Prince George's County police force for 14 years. He was 51. He died after Glenn Tyndell, 37, shot him multiple times outside Tyndell's wife home early Wednesday, police say. Tyndell led officers on a chase and fired at them. He died after officers shot back. Ramzziddin attended the Masjid Muhammad mosque in Northwest D.C.
"He was a good brother. Good father. Good Muslim," said Sabir Saleem, a retired D.C. officer and Ramzziddin's friend.